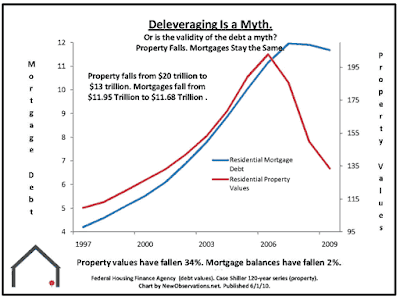 The following chart provides a great visual on why banks are holding the shadow housing inventory off the market. The red line represents property values, and the blue line represents the mortgage debt or what Americans have to borrow to purchase homes. Home values since the Spring of 2006 have fallen from $20 trillion down to $13 trillion. 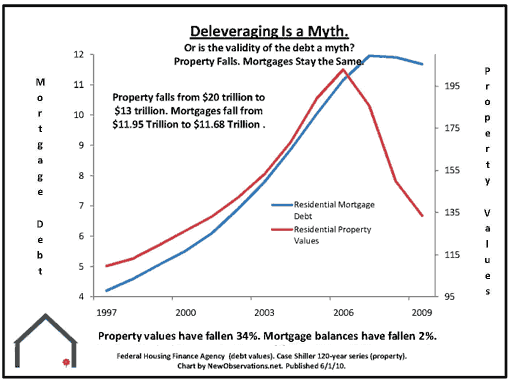 The total mortgage debt, however, has only fallen $270 billon. The gap seen provides a glimpse at how far "under water" homeowners now find themselves. More importantly it shows the health of the financial system. If banks had to mark their assets to market, instead of myth, they would instantly be insolvent. This is why they are currently hoarding the free cash they are receiving from the Federal Reserve, and it is also why as our economy moves back downward during the second half of the year the Federal Reserve is going to have to think of new and creative ways to get printed dollars into the hands of consumers. 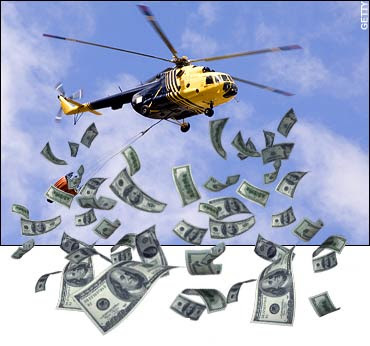 Look for helicopters in the sky this Christmas as they may finally decide to start dumping money from the air.